Own a fixed moment in time. Every modern telescope is based off this mirror and Newton's design. From the Hubble to the new Webb telescope, they all trace their ancestry to this mirror's design. The Original Mirror represents what Newton saw the day he pulled his from a sand mold. This is an untouched new mirror. 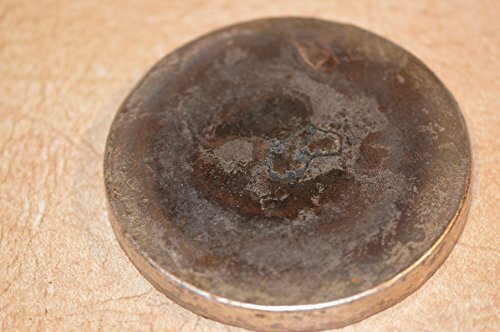 The mirror is 4 inches in diameter and was hand poured in my foundry. It is 6.7 times larger than the 2 inch mirror. The pictures are representative of the mirror you will receive. As they are all handmade, yours will vary. The Original Speculum Telescope Mirror is not only the greatest astronomy gift ever, it is also a real speculum metal telescope mirror blank. It can be easily ground into a working, turn of the century, telescope mirror. You can see what Newton saw. There is a 30 day 100% satisfaction money back guarantee (see shipping and return policies). If you are planning to grind your new mirror find tips how to grind speculum mirrors.